The Cape Town Book Fair is back as the South Africa Book Fair. The longterm plan is to have an annual book fair but for it to alternate between Cape Town and Johannesburg. My weekend plans changed and I had a chance to go yesterday. I booked for the breakfast session: radio journalist Nancy Richards interviewing the English author Susan Lewis. Read a lot of books in the genre you wish to write. There are many authors who who write well: learn from them. Recognise that as a writer, you are part of a team. The book has to be edited, marketed and sold. Enjoy your first line and remember that it can be changed. Having had the opportunity to listen to a number of well known authors talk about their lives, I have reaslised that it is hard work. Susan Lewis, for example, has to produce 2 books a year and she does all her own research. Judi Picoult said her year was in 2 parts: 6 months of the year was spent on research, 6 months on writing. Add to that the emails that have to be answered. After the formal session, I had coffee with Susan and talked to her about her project for Breast Cancer Care. Susan's involvement with breast cancer started when her mother died of breast cancer. 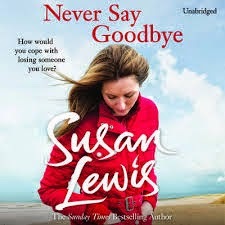 Earlier this year, she wrote a book "Never Say Goodbye". I haven't read the book yet but understand it to be about the friendship between 2 women from different backgrounds. One develops breast cancer and undergoes treatment. During the course of writing the book, Susan became more involved with Breast Cancer Care and is inviting people to send in stories about support. The stories will then be compiled into a book and the proceeds will go to Breast Cancer Care. During my working life, I am privileged to hear extraordinary stories of hope, courage and support. Do you think we should compile a Southern African version of personal stories? Could we use narrative to dispel some of the myths preventing women from seeking help? Susan: thank you for time and inspiration. It is up to us to do something locally. Being an author is surely hard work. YOu have to gather all teh thoughts and incidents then pen them all down. Sometimes writing personal lives is also a difficult task.